Below you can view all the homes for sale in the The Oaks subdivision located in Chapel Hill North Carolina. Listings in The Oaks are updated daily from data we receive from the Raleigh multiple listing service. To learn more about any of these homes or to receive custom notifications when a new property is listed for sale in The Oaks, give us a call at 919-759-5770. 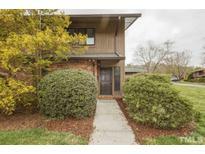 9' ceilings on the main floor, abundant hardwoods, Pella windows, spacious master bath, updated K, home warranty, convenient to I-40, RDU, and UNC and Duke. MLS#2247919. 64. Desirable Oaks community with clubhouse and pool, convenient location to everything, Chapel Hill schools! MLS#2247079. 5026. Classic Goforth Contemporary, multi level living featuring foyer with crab orchard inlay, living room with hardwood flooring, fireplace and hand finished balancing built-ins, kitchen has Corian counter tops and brick floors, office/study with custom cabinetry, main level bedroom has full bath and access to deck, family room with fireplace and views, 2nd floor Master with spa, 2 additional beds have baths en suite, lower level workshop, home sits on almost an acre, porte cochere for parking, it's perfect MLS#2245896. 29. Convenient to I-40, RTP, and RDU. Warranty. MLS#2244908. 64. Plenty of decking - fulfill all alfresco+relaxing by nature aspirations. MLS#2242613. 150. Conveniently located in the coveted Oaks neighborhood strolling distance to the Chapel Hill Country Club (golf, tennis, pool) and minutes from UNC, downtown C.H. & Durham. MLS#2240694. 150.
bonus w/ pool table and bar. MLS#2240364. 118. 3rd floor would make a dreamy nanny/teen suite, office or studio. MLS#2239357. 3336. All bedrooms upLots of upgrades including built ins, Miele dishwasher, newer Bertazzoni 5 burner gas range and more! MLS#2238637. 722. New colors throughout-Main w/ formal living and dining rooms, study/office, bedroom, family room with volume ceiling and fireplace, Kitchen boasts commercial grade appliances, Master suite w/ redesigned soaking tub, oversize shower, double vanities, walk-in closets, main level laundry with custom cabinetry, 2nd level has bed with bath en-suite, two beds share jack and jill, media center, lower level w/ full bath, sauna, wine, kitchen, gym, pool, hot tub! MLS#2237563. 29. Large wood burning outdoor fireplace & stone patio area complement the pool amenities. MLS#2206238. 331. Gracious circular drive adds curb appeal to finely landscaped .74 acres MLS#2202278. 48. The sports house features a full size indoor pool with slide, diving board, huge entertainment room with full kitchen, pizza oven, media room and a guest suite.Patios, screened porches, outdoor sports court, hot tub, gardens. MLS#2190496. 4655. Deficiencies Taken Into Account W/ Asking $. MLS#2156167. 64.